25.02.2006 Honey-Emerson puppies are now 7 months old! 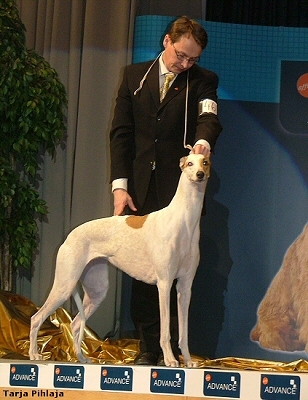 Most successful show dogs of the year 2005 were invited to the gala night where "Champion of Champions" was chosen. 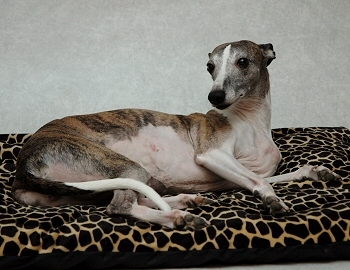 Loulou, Ch Whiptails Lullaby Sky was among four best dogs out of those 52 that participated this year. Judges were: Svend Lövenkjaer, Denmark, Kirsti Lummelampi, Finland and Bo Skalin, Sweden. 31.01.2006 Finnish show Whippet of the year 2005 results have been confirmed. Our little Ida (Whiptails Milk'n Honey) began her show career in an unofficial Match Show in Järvenpää. Ida behaved like an angel with end result of best winner puppy and later on with BIS-1 over all adults! 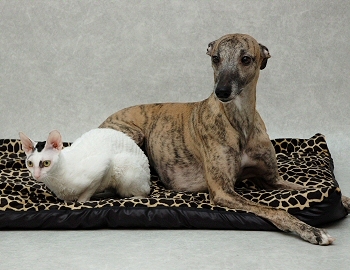 Greyhounds were judged by Knut Blütecher, Norway. 21.01.2006 Happy birthday Milo & siblings - 3 years! 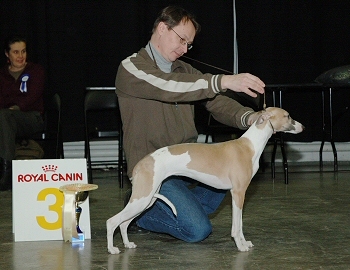 Whippets were judged by Harri Lehkonen. 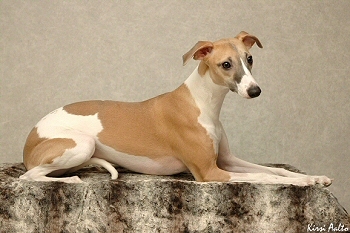 Kille, Whiptails Spice'n Ice was 2nd in the younger puppies' (5-7 months) class. Wonderful news from California: Song, Whiptails Solstice Sky Song is new Champion! 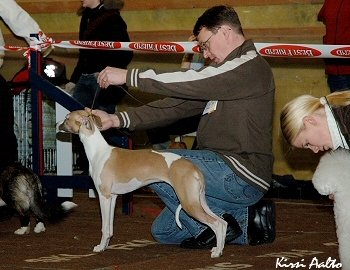 Whippets were judged by Roberto Schill, Romania. 01.01.2006 Take a look at some winter fun photos! The photos were taken in Ilmajoki.